Our Guest House is very easy to find as guests can testify. We are located on Ashby Road (the A512) between the main university roundabout and Loughborough Town Centre. Guests usually stop to off-load directly outside the house and then are directed to off-street parking at the rear entrance of the garden. You can walk to the University main gate in just seven minutes, and we can advise you on the time needed to reach the individual departments. Alternatively, there is a bus running every ten minutes during the day from the train station through the university campus. This passes within two minutes' walk from our house. 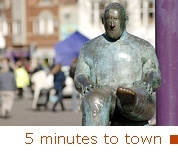 Loughborough Town Centre is also just a five-minute walk away. 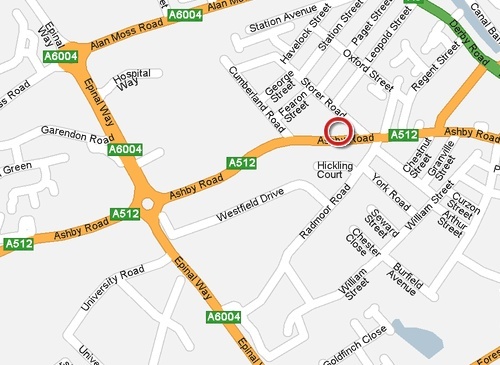 On the map below, find us on Ashby Road between Cumberland Road and Storer Road, and on the same side. Our guest house is just a 5 minute walk away from the East campus areas; 15 minutes walk away from the west end of campus. Our guest house is just 5 minutes walk from Loughborough town centre.